After we clean your windows, if it rains on them within 24 hours and spots them up, we will reclean them at no charge! Why would we make such a promise? Doesn’t that cause us to run around the Dayton and Cincinnati area recleaning windows all the time? No, your windows don’t spot up for a while if we have cleaned them. How? Have you ever seen after a creek has flooded, there is a debris trail at the high-water mark? That same principle applies to glass. The spots are caused by the rain contacting the dust, pollen, etc. that has accumulated on the glass. As the windows dry, the soil pools near the edges where the water droplets were, leaving the soil. After we clean the soil from your windows, there’s just nothing left on your window for rain to pool, causing spots after the water evaporates. 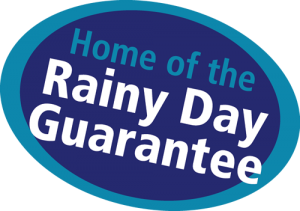 If it’s raining on the day of your cleaning, we will clean your windows as scheduled unless you have exterior storm windows or windows that must be opened to clean them. We will reschedule your window cleaning if there is lightning or high winds. During periods of heavy rain, we may stop to let the heavy showers pass, then resume cleaning. Your satisfaction is what’s important to us and we work hard to earn it. Approximately 70% of our new business at Sonrise Services comes from referrals from happy customers. We intend to make you a happy customer too!